Want to see John on stage speaking? Click here. Want to see Matt on stage speaking? Click here. Is your organization ready for tomorrow? 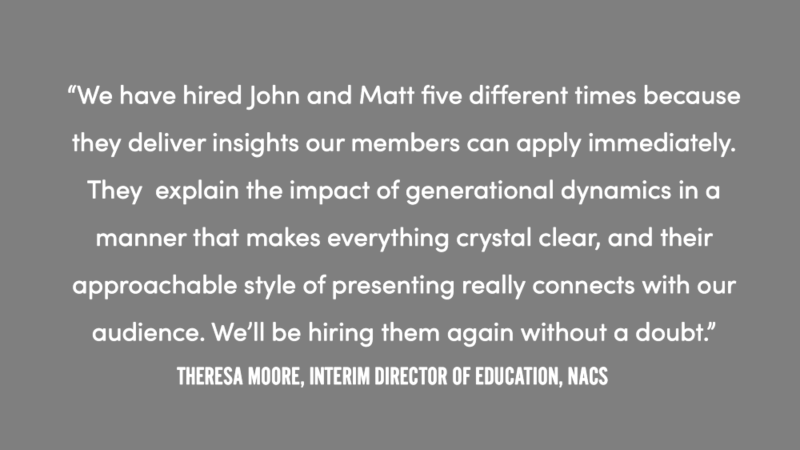 Matt Thornhill and John Martin, founders of SIR's Institute for Tomorrow think tank, are researchers, authors, futurists, and provocateurs. They help leaders learn what's coming and what to do about it today. For over 50 years SIR has researched and studied the key trends that are shaping the future. And the people who will make it happen. 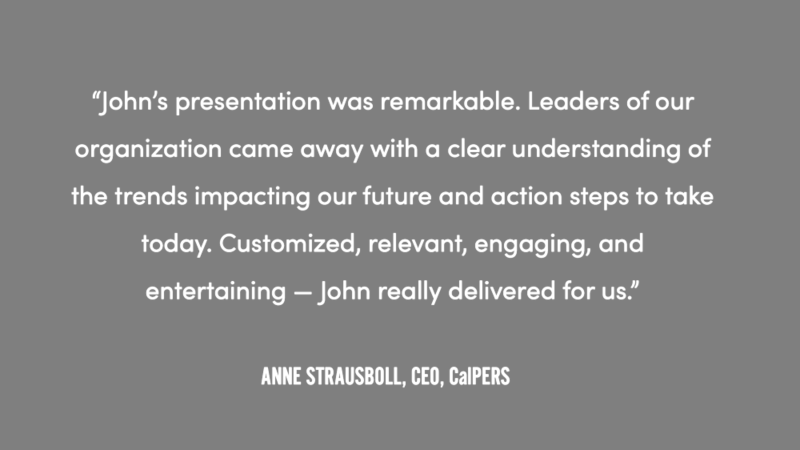 Now, we equip leaders how to become futurists themselves, by sharing our data-driven insights via keynote speeches, workshops, and training events around the world. Get insights on the future of keynote speaking in "The View from the Stage" (2:51 duration). One area where we think it's high time we get the language right is around what's happening to the demographics of America. We are growing older, which is better, and more accurate, than saying we're aging. Spend two minutes learning about the realities facing workplaces today. There are not enough workers for the jobs available. Now what? Back in the 1970s, when the Boomer generation entered the workforce in large numbers, things were different. First, there was company loyalty. You didn't just go work for someone, you "joined" a firm, ideally for a long career of 40+ years. Back when I was in the advertising business at Ogilvy/New York, I was taught the importance of “leading from below.” The idea is simple: Manage your manager. Lead your leader. Boss your boss. It’s great to live in a country where Black Panther is the number one movie. Wayne Simmonds won the NHL All-Star game MVP. LeBron James didn’t “shut up and dribble.” And Oprah might be running for president in 2020. That’s where we are, but there’s little doubt that it’s been a rough several years in terms of race relations in America. But what’s next? Every year, we travel all over the world speaking at 50 or more events organized by companies, associations, and other entities. Every event is different in size, scope, audience, and effectiveness. Having done this for a dozen years, we’ve learned a thing or two because we’ve seen a thing or two (hat tip to Farmers Insurance). Who’s Out of Line: Your Workers or Your Culture? There’s a growing pain point leaders in organizations of all types, kinds, and sizes are struggling to address. It’s issues around workers and the work culture. There isn’t much alignment these days. 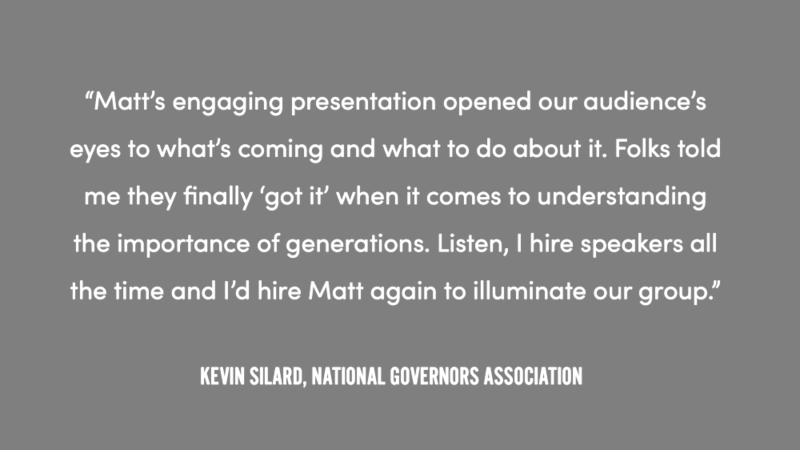 Our keynote presentations change organizations and communities for the better.